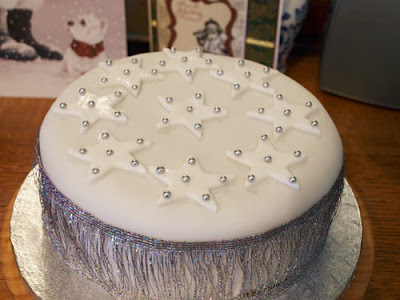 A very simple cake decoration, but it looks festive enough and another job ticked off my list. There are pictures of the snow that fell last night over on my other blog Serial Crafter if you'd like to see them. That looks super Janice. Is it fondant? I did some with snowflakes, I got some really nice lustre powder which I dusted them with. Oh Janice that looks lovely! Beautifully decorated. I didn't get around to making a fruit cake this year, but if I had it would never have looked as good as yours. Cake looks wonderful. I'm going to have to be more organised next year and make a Christmas cake, I think! Janice, sure looks everything festive in your house. Your cake cooks so beautiful, perfect for this cold snowy day. I have not made my Christmas cake yet. The days just pass by too fast! What a beautiful looking cake Janice! Very professional. I'm ashamed to say we've already devoured over half of ours so I'm thinking of making another one. It's the nicest cake recipe I've had which makes it a bit dangerous really. It looks amazing! My cakes taste good but NEVER look so good! Save me a slice?